Every year, for hundreds of years, between the 3rd and the 5th of February, Catania, the second most important city in Sicily, dresses in white in honor of St Agatha, the patron saint. New Travel Services will take you to discover this fascinating event which will remain forever in your memory, to see the most moving demonstrations of faith during the days of this procession. The city is filled during these days by the faithful, who hold lighted candles up high: the more there are, the more important is the forgiveness asked of St. Agatha. The Patron Saint of Catania was killed by non-believers and burnt at the stake and now, in contrast, Etna â the fiery giant looks down, from its height of 3,300 metres, at the celebrations, forever watching over the faithful. The 4th of February is the day when the residents of Catania can touch their Saint. The streets fill up with people. These are the devout â who wear the traditional long, white, ankle-length garment, tied at the waist with a cord, a black velvet beret, white gloves and they also wave a white handkerchief. 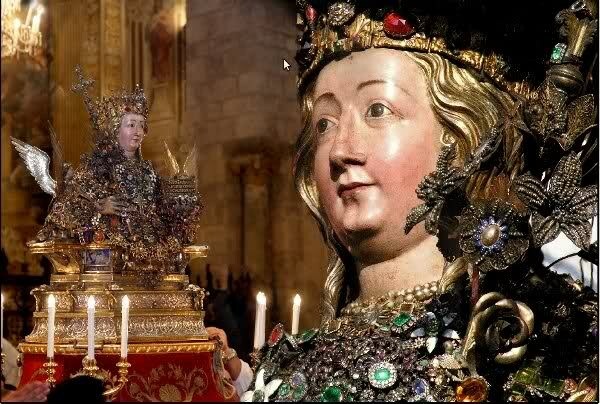 The statue of St. Agatha appears with a smiling, serene face to her faithful followers, covered in gold and precious stones, and is carried around the city for the entire day, passing by the cathedral dedicated to her and along all the locations of the martyrs. The faithful, in their thousands, all in white, pray, many crying with emotion, and all follow the statue, crowding through the narrow streets and squares, and shouting their devotion to her: âcitizens, citizens, we are all devoted, citizens, long live St. Agathaâ. After hours of praying and processions, in the late morning the most important mass is celebrated in the cathedral, theâ Pontificaleâ. Then at sunset the second part of the procession takes place, winding through the streets of the centre of Catania, passing through the âBorgoâ of the street of Saint Julian, a long uphill road, which acts as a trial of courage for the faithful. The devoted follow the statue , while the city also celebrates the flavours of St. Agatha, with typical cakes, such as the â Minni di SantâAitaâ which resemble the breasts which were torn from the saint during the torture she underwent, to try and force her to denounce her faith. Come and discover the fascination of the city of Catania during the days of St. Agatha, between the 3rd and 5th of February of every year. Donât miss the feast days, with the assistance of New Travel Services personnel who will, in our luxury cars, take you to discover this tradition. New Travel Services, the heart of Sicily.